Archive » Take Your Hands Off The Earth! On September 24th, we were joined by activists from six countries as well as Victoria Tauli-Corpuz, the UN Special Rapporteur on the rights of Indigenous Peoples and Anuradha Mittal, the founder of the Oakland Institute, who moderated the Terra Madre Forum on land grabbing, “Take Your Hands Off The Earth”. As Mittal pointed out in her opening speech, food prices have risen both in nominal terms and as a percentage of spending for people in the developing world since 2008, with the amount of household expenditure on food up by as much as 50%. The capacity of poor people in developing countries to grow their own food and feed themselves without reliance on imports or supermarkets is more important than ever, insofar as it represents people’s ability to withstand the whims of the free market. When we think of land grabbing in Africa, all too often we think of China or the Gulf States as being the principal actors, but this is far from the truth. “Development agencies, universities, pension funds, Norwegian churches, banks and private equity funds are all involved.” There is also a common perception that the lands grabbed are then turned over to monoculture production of soy, corn or palm oil, products which sustain unhealthy Western diets with lots of sugar and meat. But in fact, a lot of the time something even worse happens. The lands are not used to grow any food at all, but left completely fallow. “This is true for the majority of the hundreds of land contracts we have studied,” Mittal tells us. “They grow nothing at all, but simply speculate on the land in order to sell it at a profit later.” The consequences for the previous residents of these lands are internal displacement, hunger, and violence if they try to resist. In cases, where lands are used for agricultural production, furthermore, the nature of social relations is changed, as the new owners create seasonal jobs, meaning the people who once farmed the land freely are reduced to being sharecroppers, inevitably increasing profits for the new owners. Nyikaw Ochalla of the Anywaa Survival Organization in Ethiopia told us of the country’s vague anti-terrorism laws which allow the government to arrest and imprison anyone who dissents from the State’s policy. There activists such as Yonatan Tesfaye who are facing the death penalty in Ethiopia simply for criticizing the government’s crackdown on anti-landgrabbing protests on Facebook. Mamy Rakotondrainibe, a key activist in the Collectif pour la Défense des Terres Malgaches in Madagascar, told us how the South Korean company Daewoo had bought over a million hectares of land there in 2009 to create an enormous palm oil plantation, the product of which would have been exported back to South Korea. The deal represented half the country’s arable land, and the Collectif pour la Défense des Terres Malgaches petitioned the government to stop it. At first the government ignored the petition, and it was only after violent protests which left over 100 people dead that country’s President Ravalomanana fled to South Africa, and his replacement stopped the deal. Nonetheless, smaller but less-publicized deals continue to go ahead in Madagascar, slowly stripping the population of their ancestral lands, in a country where 65% of the population live from agriculture. Andrew Orina from Kenya told us how the construction of hydroelectric dams on Lake Turkana (the fourth largest in Africa, and the world’s largest alkaline lake) threaten its very existence, and it will likely be split it in two. This will force massive migrations, loss of arable land, destruction of fisheries, and an ecological disaster. Edward Loure, a Goldman Prize winner from Tanzania, is pioneering a fightback against land grabbing in his country through deeds which recognize indigenous communities’ collective right to their ancestral lands, rather than and instead of any one individual’s propriety. Despite this, Tanzania continues to be a prime target for foreign direct investment in land, and it will require a sustained struggle against the investors to secure the rights of these indigenous peoples. Helpme Hamkhein Mohrmen of Northeast India told us how in that region, it is a change in thinking about land brought about through modern legal structures which is to blame for tensions over land. In the past, the indigenous clans saw themselves as “custodians” of the land, that is, not having inherited the land from their ancestors, but borrowing them from their children. This idea of custodianship is dying out, replaced by ideas of propriety, which has mainly been exacerbated by the recognition of the value of the region’s mineral resources (including Uranium) which were once irrelevant. Néstor Joaquín Mendieta Cruz of Colombia, who is also a Slow Food convivium leader, recounted how since 1990, the amount of land available for agricultural production in Colombia was 2.5 million hectares, which has now been reduced to 1.5 million. Half of this land, 500,000 hectares, is now used for the production of palm oil, and despite Colombia already being the number one producer of palm oil in South America, the government plans to increase the amount of land dedicated to its production to a million hectares. In some regions of the country, private security forms create checkpoints along the roads to stop local people from occupying their lands. Victoria Tauli-Corpuz brought a message of hope to the audience, and clearly conveyed her conviction that the fight for indigenous peoples’ land rights is an essential part of the struggle for global food security. As UN Special Rapporteur for the rights of Indigenous Peoples, she wants to see laws still in force from the colonial era which consider indigenous lands to be empty (as happened in Australia and the Philippines) revoked, and is leading the charge by tackling governments directly, around the world. Though many of the large industrialized countries, particularly the United States, Australia and New Zealand ignore or deny her reports, progress is being made. 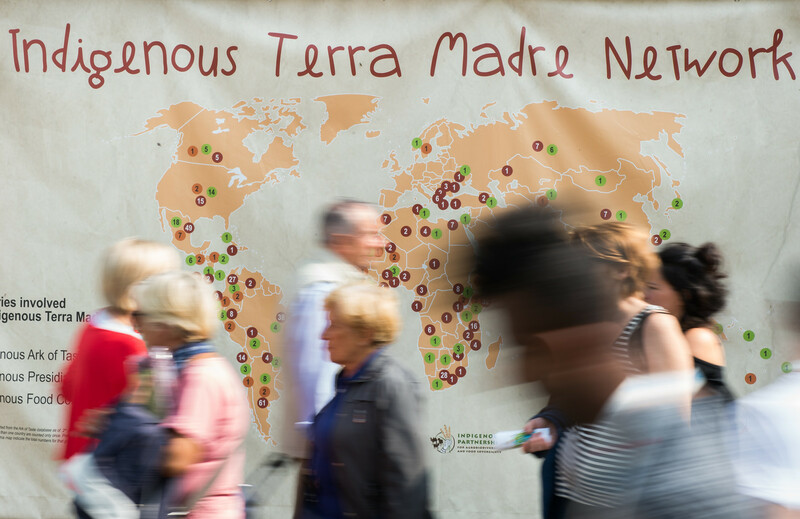 We need a concerted, collaborative effort, which Slow Food can proudly take part in, in order to reverse these trends and shift government policy around the world in recognition of land rights, and against land grabbing.